One hundred years ago, at the beginning of the history of the National Art Museum of Ukraine, which was first called the City Museum of Antiques and Art, there was hardly any concept of Ukrainian professional art. Ukraine was always famous for its national ethnographical applied art. The founders of the museum's collections decided to prove that this opinion was wrong and defined the list of main representatives of Ukrainian fine art. These scientists have included in the list not only those who were born and worked in Ukraine, but also those national-conscious artists who lived abroad. They thought that foreigners who worked in Ukraine have enriched a national culture too. These principles were the basis of their collective work. So works of T. Shevchenko, I. Repin, V. Borovikovskiy, V. Tropinin, N. Pimonenko, M. Vrubel, N. Ge, G. Narbut, A. Murashko and V. Krichevskiy became a part of the museum's collection. The collectors have found even some older works ranging from medieval icons to Cossacks times portraits of military and church leaders and humorous comic pictures «Cossack Mamay». Things came to collection from different areas ranging from far western Galitsia to eastern Tchernigovshina areas. They looked for masterpieces of Ukrainian art in Moscow and Saint Petersburg and even wrote correspondence to Ukrainian artists living in Europe and America. Though this activity was stopped during the Stalin's repressions, and a big part of collection was dispersed or hidden, the tradition is still alive. Today there are a lot of new works of art coming to museum's collections. Among these new comings are: unique icon relief «St. George in His Lifetime» dating to the 12th century; works of the founder of international abstractionism Kazimir Malevitch, who was native Ukrainian; masterpiece of Ukrainian rococo «The Great Martyr» icon, graphics of world famous Ukrainian living in the USA, Y. Gnizdovskiy. Now there are thousands of exhibits presented in the museum's collection. The 1990s, the first decade of Ukrainian independence, were the time when museum came to an international level. For the first time in the museum's history its collections were exhibited in famous museums of Canada, France, Denmark, Croatia. The world discovered an advanced culture of the country with 10,000 years of history. As a result, some previously infamous artists became a part of international art elite. For example, A. Petritskiy is considered to be one of the best set designers of the 20th century, V. Yermilov is known as the most laconic constructivist of the 20s, and O. Bogomazov is ranked as one of the best futurists of Europe. Those exhibitions also have discovered the Ukrainian side of some famous Russian artists as O. Exter, A. Arkhipenko, D. Burluk. The items from museum's collections often become the sensations on international exhibitions. In 1997 on «The Fame of Byzantium» exhibition the 12th century icon «St. Geroge in His Lifetime» gained the steadfast attention of the specialists. 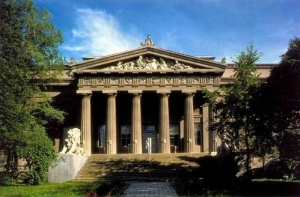 The National Art Museum of Ukraine is of course not the oldest in the list of most famous museums of the world. But its prestige is constantly becoming higher. And the belief of museum founders that Ukrainian culture is valuable on international level today has spread around the world.